More new ReTweet data! In the past few weeks, I’ve looked at quotes and hashtags and images. 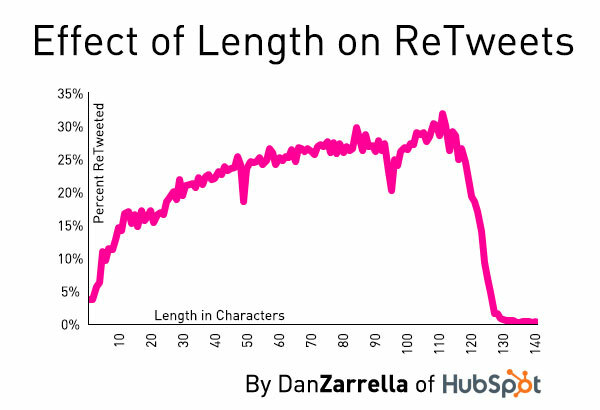 This time I decided to look at Tweet-length, in characters and it’s relationship to ReTweets. The data set is up to 1.4 million randomly selected Tweets, from 1.2 million different accounts. I found that Tweets between 100 and 115 characters were 34% more likely to be ReTweeted than Tweets outside of that range, with a 99.9% confidence interval. A big drop off in ReTweet probability occurs once Tweets get beyond about 120 characters, but up to that point, the longer the Tweet, the better.